Maa Durga is one of the most lovable gods in the Hinduism. She is being worshiped with different mentions in the religious scriptures which include Vedas. Maa Durga is the epitome of righteousness and Shakti. 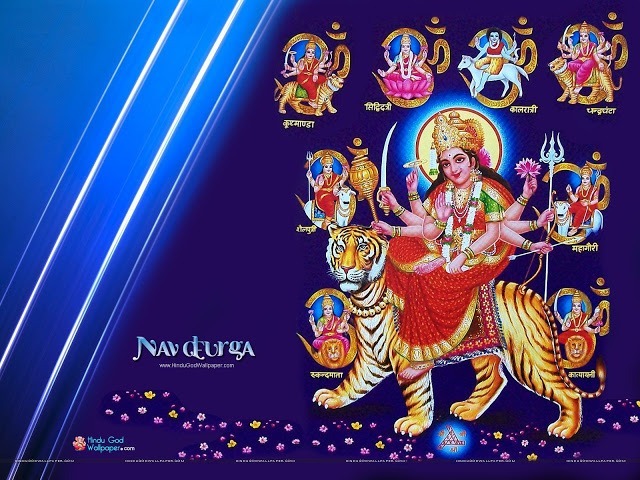 According to her Devotees, she can protect them from all fatal evil and harbors the energies of all the Gods.You can watch more God wallpaper from this website. 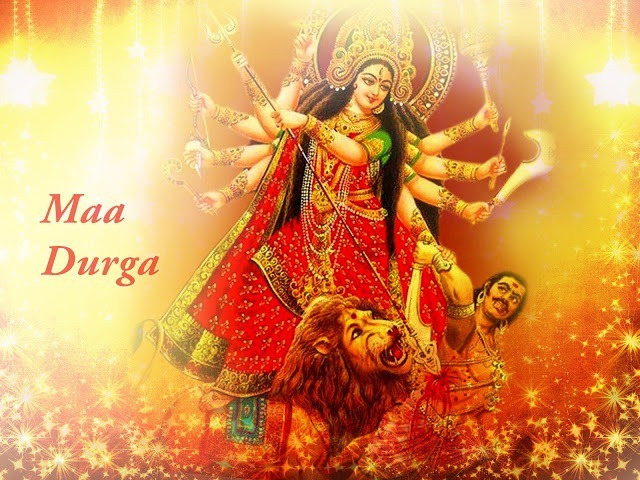 Durga Puja is associated in only some states of India with the demon slaying Mahisasura. There are also other symbolism and festivities related to the Goddess worship. As per the legend knowledge, Maa Durga took the form of Chandi for the purpose of slaying the demon Mahisasura. Due to the higher popularity of this legend, Maa Durga is sitting on a tiger or lion and slaying the demon with a trident or spear. The beginning of the Durga Puja is known as the Goddess awakening and shlokas and special chants are used to respect her. Maa Durga is seen with her children namely Kartikeya, Ganesha, Lakshmi, and Saraswati. India is a country where you can find lots of festivals of different religions and cultures. Navratri is one such festival. 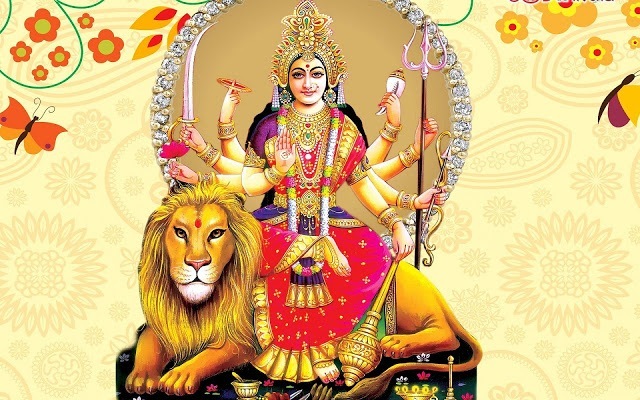 Navratri is the festival dedicated to the worship of goddess Durga. 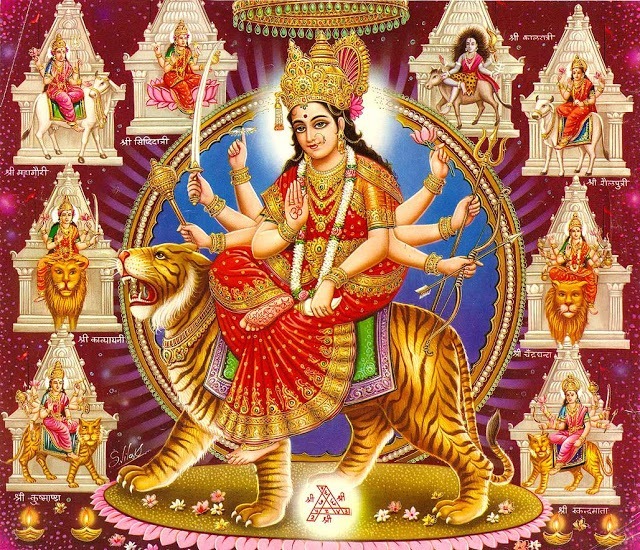 The meaning of the word Navratri in Sanskrit is nine nights. Nav meaning nine and ratri meaning night. 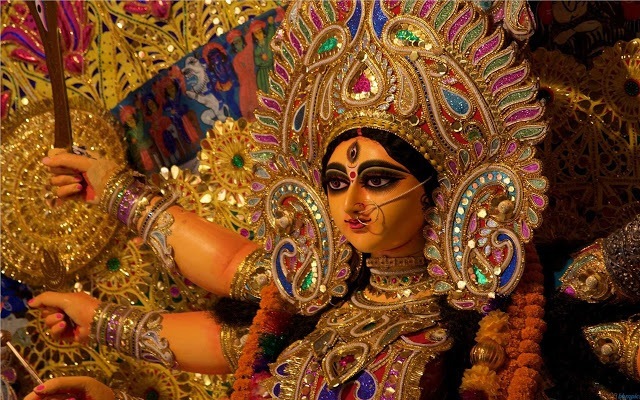 The nine forms of goddess Durga are worshipped during these nine nights. The tenth day is commonly known as Vijaya dashami or dussehra. Navaratri is an important festival which is celebrated all over India by most of the people. Diwali is the festival of lights which is celebrated twenty days after dussehra. The festival is celebrated for nine nights every year during the month of October. The festival is celebrated with lights and colours and crackers and enthusiasm and what not. You can simply search for Maa Durga images on the internet to get an idea of how the people celebrate this festival. People wait for this festival throughout the year. 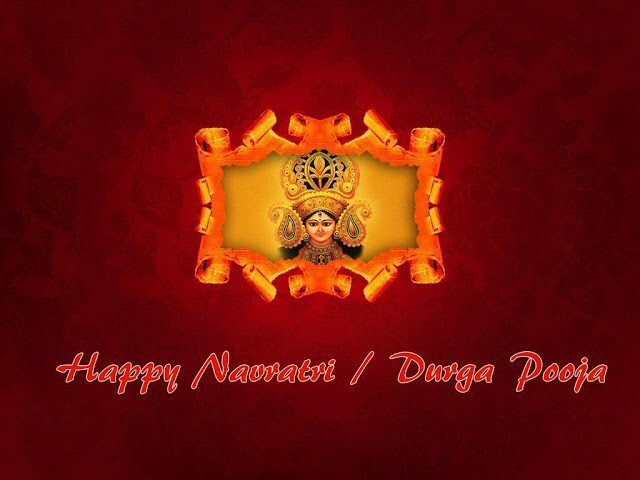 On the first day of Navratri known as Pratipada the ‘Shailaputri Maa’ form of Durga is worshiped. The second day of Navratri known as Dwitiya worships ‘Brahmacharini’ form of Durga. The third day of Navratri is called Tritiya. On this day the ‘Chandraghanta’ form of Durga is worshiped. Chaturthi is the name given to the fourth day of Navratri. ‘Kushmanda’ is the form of Durga being worshipped on the fourth day. ‘Skandamata’ is the form of Durga being worshipped on the fifth day, known as Panchami. On the sixth day or Shashthi the ‘Katyayani’ form of Durga is worshipped. On seventh day or Saptami the form of Durga being worshipped is ‘Kaalratri’. Eighth day or Ashtami worships ‘Maha Gauri’. And finally on the ninth day or Navami the ‘Siddhidatri’ form of goddess Durga is worshipped. Many people celebrate this festival in many different ways. Some people, who love to eat, celebrate these nine nights by eating tasty foods and trying out new dishes. 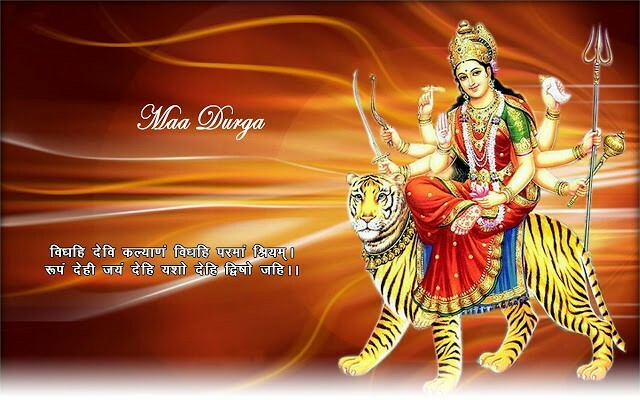 People who love to use social networking sites, share or upload Maa Durga Wallpapers on such social networking sites. 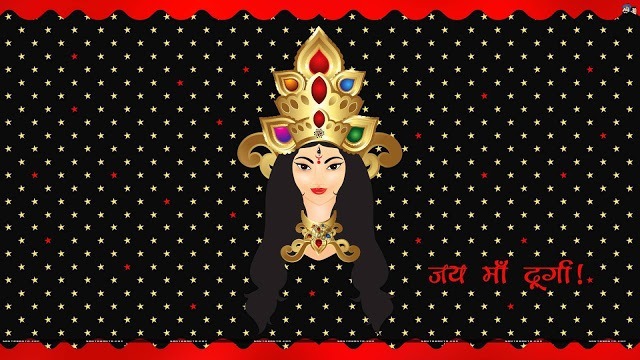 Some people also send Happy Navratri images to their friends and relatives via messaging apps to wish them and thus celebrate the festival with their near and dear ones. Actually, Navaratri is celebrated five times a year. They are named as Vasanta Navaratri, Ashadha Navaratri, Sharad Navaratri, the Paush Navaratri and the Magha Navaratri. Among these, the Sharad Navaratri and the Vasanta Navaratri are the most important ones. The Navratri images found on the internet will give you a clear idea about the five types of Navratri being celebrated throughout the year. 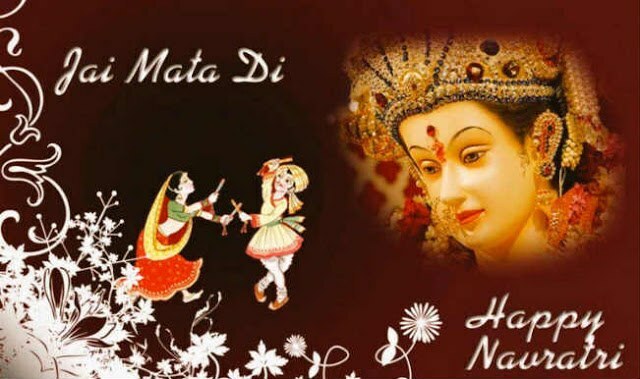 You can easily find and download Happy Navratri images from the internet to wish your near and dear ones during this auspicious occasion. This festival is the only festival which is celebrated by almost each and every Hindu. The festival is a good opportunity for everyone to meet and enjoy with their family, who might stay away from each other throughout the year due to work or other reasons. 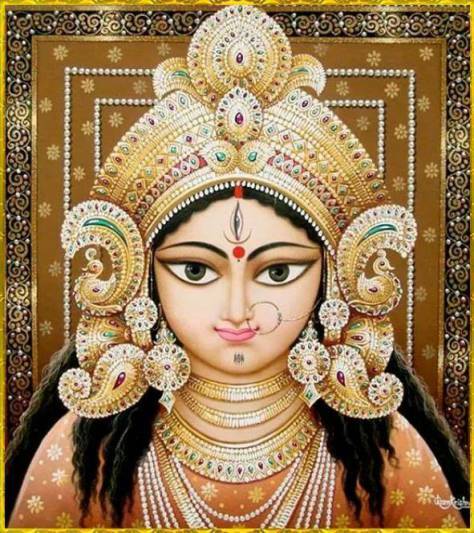 Maa Durga is the form of the Mother Goddess in Shaktism. 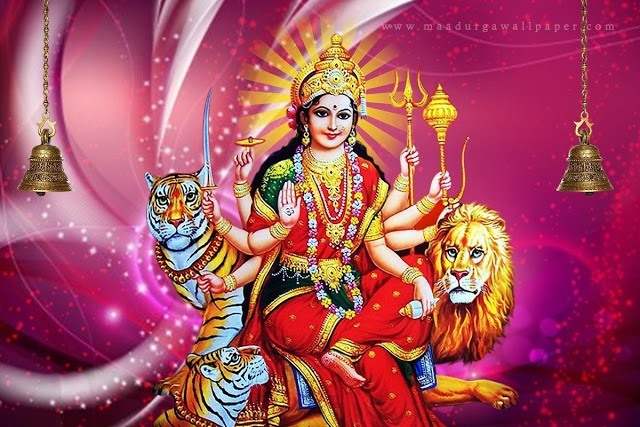 There are many incarnations of Goddess Durga such as Kali, Renu or Renuka, Bhagvati, Bhavani, Ambika, Lalita, Gauri, Kandalini, Jaya, Rajeswari and has nine appellations known as Skandamata, Kushmanda, Shailaputri, Kaalratri, Brahmacharini, Maha Gauri, Katyayani, Chandraghanta, and Siddhidatri. A list of 108 names that is used to describe her is popularly used by eastern Hindus and is called Ashtottara Shatanamavali of goddess Durga. The festival of Durga Puja marks the victory of Goddess Durga over the evil buffalo demon Mahishasura. Thus the festival of Durga Puja symbolizes the victory of Good over Evil. 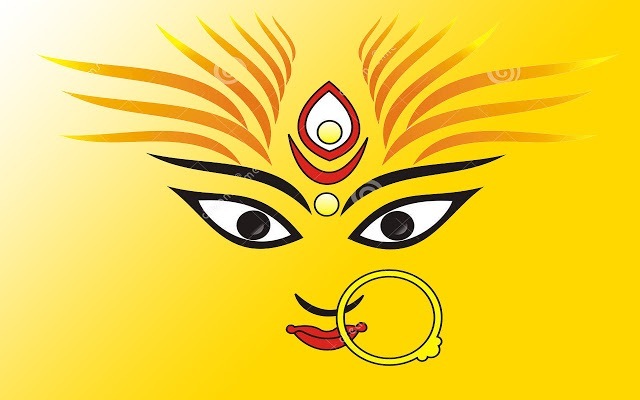 Durga is worshiped as Durgotinashini in Bengal. Durgotinashini means the destroyer of evil and the protector of her devotees. There is a common belief among the Bengali Hindus that goddess Durga will protect them and their families from all sorts of evil. So they stick up Maa Durga Wallpapers in their cars or other vehicles or keep small idols of Maa Durga in their vehicles so that she can protect them from accidents. Durga Puja is widely celebrated in the Indian states of Assam, Bihar, Jharkhand, Manipur, Odisha, Tripura, Meghalaya and West Bengal. In both West Bengal and Tripura, due to the presence of a large number of Bengali Hindus, Durga Puja is the biggest festival of the year. 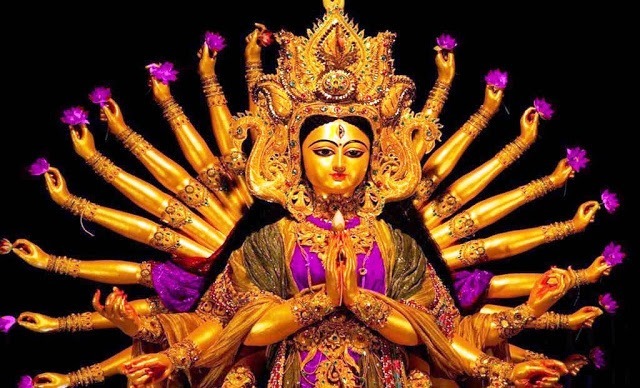 Apart from Eastern India, Durga Puja is also celebrated in Delhi, Uttar Pradesh, Maharashtra, Gujarat, Punjab, Kashmir, Himachal Pradesh, Haryana, Rajasthan, Uttarakhand, Madhya Pradesh and Sikkim. Durga Puja is also celebrated as a major festival in Nepal where 82% of the population is Hindu and also in Bangladesh. Nowadays, many Bengali cultural organizations arrange Durga Puja in countries such as the United States, Canada, United Kingdom, Australia, Germany, France, The Netherlands, Singapore, etc. Durga Puja also includes the worship of Lord Shiva, along with Lakshmi, Saraswati, Ganesha and Kartikeya, who are considered to be Durga’s children. In modern days Durga Puja is celebrated by a display of decorated pandals and artistically depicted sculptures of Maa Durga. People exchange Vijaya greetings and publication houses publish Puja Annuals. Durga Puja is celebrated during the last five days of Navaratri. But the Bengali Hindus worship Maa Durga throughout the year. They keep Maa Durga Wallpapers or idols of Maa Durga at their home and worship her on a daily basis. They ask for blessings from her and also pray for her protection from all sorta sorts of evil. Awesome Work. Nice Information about Durga Puja. keep creating similar to this and more better . Goodness Bless you. 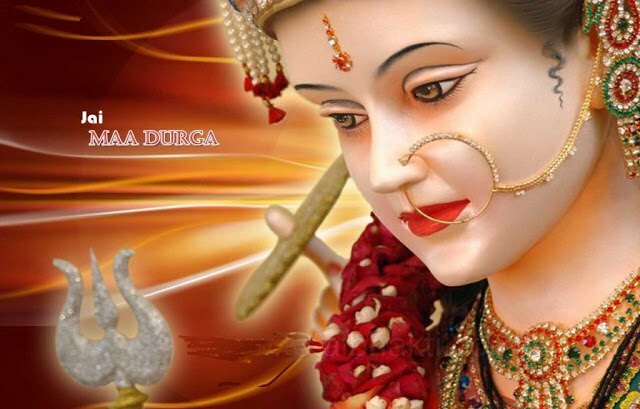 If you want to 3d and HD images of maa durga then clicked the website.